Annually southern right whales migrate from the freezing feeding grounds of Antarctica to warmer waters, reaching the South African coastline by about June, and staying through to November. During this time the waters teem with these majestic animals as they mate, calf and rear their young here, all the while treating whale watchers to animated displays of play and supremacy. This unique occurrence makes South Africa one of the best countries for whale watching in the world and each year draws the interest of local and international tourists as they flock to the Cape coast in the hope of catching a glimpse of the marine giants. Southern right whales were named by the very men who hunted them, as they were the right whales to hunt for their commercial value and floated when they where dead. This placed them at serious risk and their numbers plummeted between the 18th and 20th century. Thankfully they became internationally protected in 1935 when their numbers were drastically low and even now, despite a healthy recovery, they are said to be at only 10% of their original numbers. 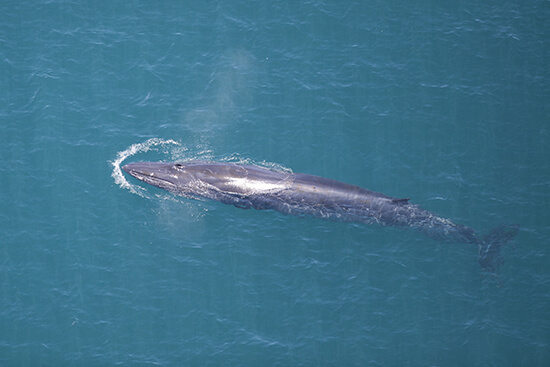 Today the southern right whale is fondly referred to as the right whale to watch. The southern right whale is a baleen whale and one of three species classified as right whales. If looking out towards the ocean in search of them, they can be identified by their lack of a dorsal fin, white callosities and a v-shaped blow, caused by their twin blowholes. The number, shape and position of their callouses are unique to each individual whale, just like our fingerprints. They grow between 14-16m in length and can weigh up to 60 tons. They live for about 50 years, breathe air, are warm-blooded and produce milk to feed their young. Whales are distinctive in that they live in families, play in the moonlight, communicate with one another and care for each other in distress, which makes it easy to understand why so many feel an emotional draw to them. Majestic and mysterious, these intuitive giants of the ocean deserve to be protected, not only for us to watch and appreciate, but also as a source of encouragement to mankind. BLOWING: the sound the whale makes when dismissing air through its blowhole, usually accompanied by a spout of water into the air. This is the normal breathing pattern of the mammal and makes spotting them a little easier. BREACHING: a thing to behold as the whale leaps out of the water and falls onto its back with a large splash. They can breach four to eight times in succession and the act is said to be a means of communication, exercise or possibly a way to get rid of the parasites. LOBTAILING: listen and watch as the whale slaps its tail on the water, causing a loud sound, something that is believed to be a means of communication. SPY HOPPING: this is a treat to see. The whale lifts its head and body vertically out of the water, allowing it to see what is happening around it. FLUKING: where a whale lifts its tail before diving. It makes for some pretty impressive photography. The best time for watching the southern right whale along the Cape south coast is between June to November, with peak calving season in July and August. The curious humpback whale can be seen between May to December, moving up along the coast from Hermanus to St Lucia in KwaZulu-Natal. The medium-sized Bryde's whale can be spotted all year round and, while rare, orcas are sometimes spotted too. Best place for land-based whale watching? South African whale-watching territory runs from coast to coast, with the denser numbers of southern rights breeding in the sheltered bays of the Western Cape. 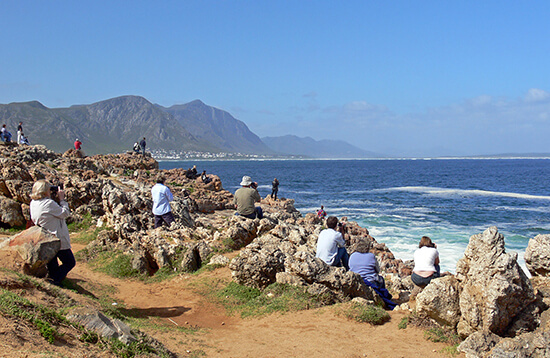 Hermanus in the Overberg has set itself a reputation for the best land-based whale watching in the country, their advantage being the scenic clifftop walk along the shoreline, which allows the whales to come in close. The town holds a whale-watching festival every September and you’d do well to find the Whale Crier near the Old Harbour, who can point you towards the best sightings. 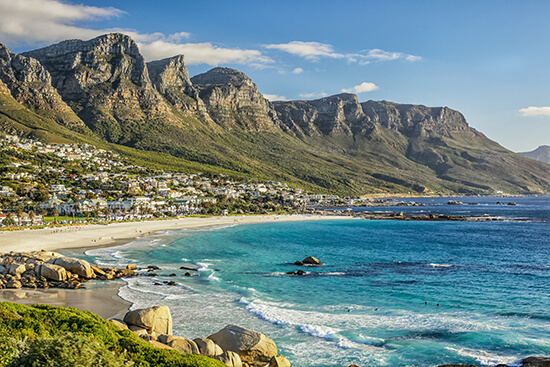 Hermanus is rich in scenery, modern infrastructure, upmarket shops and adventure options, making it easy to understand why it is annually transformed into a bustling whale-themed hub. Just further along the shoreline, De Kelder and Witsand match the whale numbers, and their smaller villages may suit those who prefer a quieter setting. 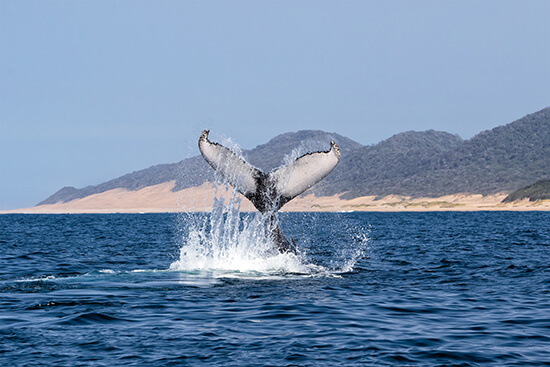 Even though Cape Town and specifically the Overberg holds rank for the country’s best southern right whale watching, you may also be lucky enough to spot them off the Mossel Bay and Plettenberg Bay coastlines along the Garden Route. Beyond there and further towards the east coast, Cape St Francis and the rugged wild coast offers vantage points to see humpback, Bryde's, minke and killer whales, as well as some southern rights close to the shore off Port St Johns. Licensed boat-based whale watching operators offer the opportunity to approach from the water, keeping the regulated 300m distance so as not to threaten or disturb them. Make sure the company you book this activity with has a permit before you get onboard. On these trips you will learn more about the anatomy of the whale, where their eyes and ears are located, their average size and behaviour patterns. Having the vantage point of viewing them from the boat offers a different perspective and most often, closer proximity. The motto ‘Observing NOT Disturbing’ is exactly how the best operators practice this activity, with emphasis on the safety and conservation of the whales and marine life. Speak to one of the Flight Centre Travel Experts about embarking on a tour with a reputable company. As though boat and land based whale watching isn’t spoil enough, you have the option of taking to the skies to get an aerial perspective of Gansbaai, De Kelder, and Walker Bay, which are favourite stomping grounds for the southern right whale. Fly above the coastal towns towards Dyer Island as you keep an eye out for the marine giants cruising or frolicking at play. At least 37 species of whales and dolphins can be found in the waters off South Africa and while out in search of whales, keep your eyes open for African penguins, Cape fur seals, black oystercatcher birds and a variety of other marine life. Bear in mind though that these are wild animals in their natural environment, and as much as seasons dictate their presence in the waters, factors such as wind and stormy weather may make sighting them difficult. An element of luck and good binoculars, are always recommended. Pre-book your South Africa whale-watching tours as part of a tailor-made Flight Centre itinerary. Make an appointment with one of our Travel Experts, and they can plan your whole trip for you. Dawn Jorgensen is a conscious traveller with a deep love for Africa, its people and the environment. From gorilla trekking in Uganda, tree planting in Zambia and turtle rescue in Kenya, she always returns to Cape Town which is home. As a freelance travel writer and on her blog The Incidental Tourist, she shares stories and photographs from her international and local travels, always with a focus on eco-tourism and the environment. Her passion remains for travel that matters and she is known to highlight ways that we can explore this beautiful world sustainably and without compromise.